From the front seat of our truck, I smiled at Chase’s observation about the main entrance of our neighborhood. When we moved into our house a few years ago, the front entrance to our subdivision was mostly woods with a couple of ponds on the south side, while on the north side was a sandy field dotted with pine trees, live oaks, and scrub brush that we affectionately called “the sand pit.” We often ran around the sand pit during our frequent family walks. We were saddened when, last fall, the sand pit was razed, leaving behind a bare, brown expanse now marked with a sign touting ‘Homes in the 200s’. For months since our beloved sand pit was flattened and all the foliage cleared out, we’ve watched the bulldozers, dump trucks, and rollers rumble through the field, intent on their task of making ready the land for stable, sturdy homes that will make up another small housing community. We joked during our daily travels that it appeared all the workers were doing was “playing with dirt.” Load after load of milk chocolate-colored dirt came in, piling high and eventually spreading around the huge field. Day after day after day. Now, nearly seven months after they began the project, the sand pit is different. The ground is higher and the dirt is spread out evenly. The foundation the builders need for the sand-filled Florida soil is at its level best, and the home-building can commence. What seemed a tedious process to my untrained eyes became clear as the bare field is now ready for the home foundations to be built at last. 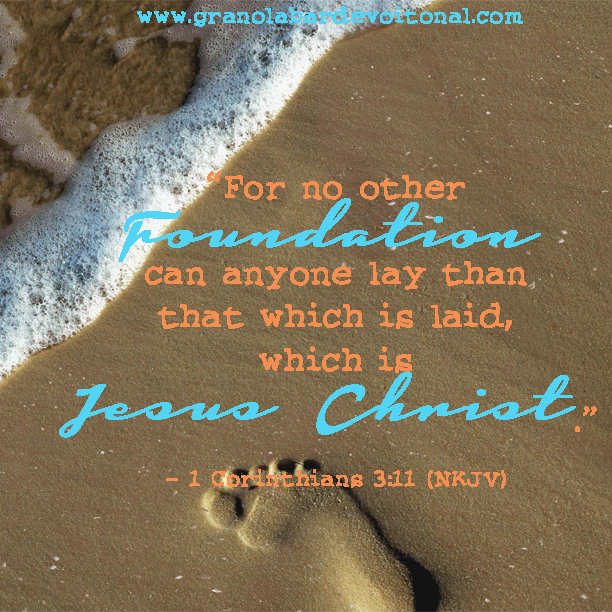 So too, Christians need a solid, unchanging foundation upon which to build our faith. Because “Jesus Christ is the same yesterday, today, and forever” (Hebrews 13:8, NKJV), we can build our faith on Him. Sometimes that faith is razed and riled by the rolling, leveling process of trials and tribulations. Sometimes our faith is tried by the sheer volume of time. But God doesn’t play with dirt. He is shaping us into the image of His Son and teaching us to rely on Him alone. When our foundation is firmly set upon Christ’s love and grace, God can build our lives higher and higher for His glory.